Thousands of Wiley-Blackwell Online Books are available in concise subject collections, providing an easy and affordable way to start the foundation or expand your library's digital book collection. This is the perfect opportunity to add prize-winning and top-selling titles to your library at savings of up to 50%! Order before December 31st, 2011 to enjoy the great savings! For more information or to request a quote email dshand@wiley.com . LexisNexis announced that Lexis Advance is to be released to all current Lexis.com users at no extra charge over the next several months. 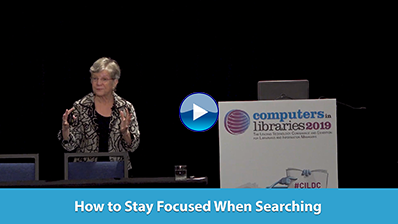 Legal columnist for Searcher, Carol Ebbinghouse, was part of the final beta test and calls the new Lexis Advance "a giant leap forward" from Lexis.com. Lexis Advance is so much more than a Google-ized version of LexisNexis. The new links and relationships, the additional out-of-contract resources, and novel presentation graphics that illuminate your findings are truly dynamic. Thomson Reuters announced that it has launched a dynamic interactive online tool offering comprehensive coverage of the U.S. Supreme Court's 2011-12 term. Case by Case: The U.S. Supreme Court combines original reporting from Thomson Reuters News & Insights with links to an extensive collection of analysis and legal materials, including motions, briefs and opinions, all sourced from Westlaw. Chemical Abstracts Service (CAS) announced a long-term collaboration with InfoChem, GmbH (InfoChem), a provider of chemical structure and reaction technology as well as data mining in chemical science documents. Under the new collaboration, research teams at CAS and InfoChem will work together to explore the technology frontiers in the field of cheminformatics. Springer announced the Springer API (Application Programming Interface) Challenge 2.0, its second competition for original, noncommercial applications using its freely available metadata and content APIs. The Springer API Challenge 2.0 is a goal-directed competition.